You have found the Sven & Ole's website! The staff and management of Sven & Ole's would like to extend a very warm "Scandinavian welcome" to all those who have surfed their way across the web to us. Our restaurant is located in Grand Marais, MN, but our reputation for great pizza is famous throughout northern Minnesota. 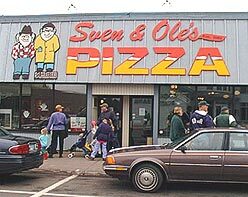 You can use this page to look at our full menu, read up on the history of Sven & Ole's, and even order merchandise and pizza (eventually)! You can also find out about what's going on in Grand Marais, and contact us via email with feedback. Would you like to receive more information about Sven & Ole's? How about information about specials arriving in your email? If you love Sven & Ole's, sign up for our customer newsletter today! To Receive Specials and Newsletters by E-mail! Curious about what else is in Grand Marais? Need ideas of fun things to do on your trip up the North Shore? Need help finding us? Take a look at our Grand Marais Events page, complete with interactive map. Also, have a look around other websites on our Area Links page! of every page of the Sven & Ole's website. Join Sven & Ole's Frequent Diners Club! Get an instant 5% discount and collect points when you use your Frequent Diner Club Card. Points can be redeemed for gift certificates or available merchandise. Frequent Diners Club Members will Periodically get special discounts and be eligible for special drawings not available to the general public. So join now! You can pick up your application at the front counter of Sven & Ole's. The Frequent Diner Club card is good at Sven & Ole's in Grand Marais only. 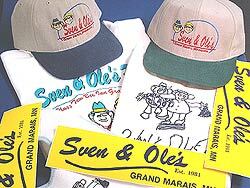 Thanks for coming to the Sven & Ole's webpage! Come again soon to see what else is new!